The literature-and even the logo-of Marchesi Antinori boasts of 26 generations of continuous wine production since Giovanni di Piero Antinori was inducted into Italy's enologists' guild in 1385. In many ways, though, only the last two have mattered. In 1966, Niccolò Antinori retired and was succeeded by his son Piero. 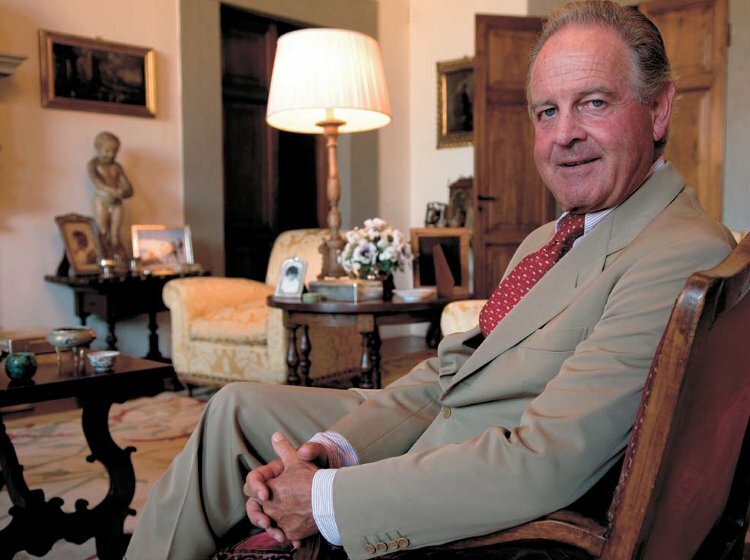 On Piero Antinori's watch, he and his three daughters have grown a modestsized family business into Italy's most important winery-one that produces more than 20 million bottles annually. Along the way, they've altered the shape and scope of Italian wine. At MGM's Aria resort in Las Vegas's CityCenter development in October 2010, I attended a multivintage tasting encompassing the four proprietary blends from Central Italy-each including French grape varieties-that have been created during Piero Antinori's tenure. We sampled two vintages of Umbria's Cervaro della Sala and four each of Guado al Tasso, Tignanello, and Solaia from Tuscany. The two-hour event was conducted by Renzo Cotarella, who met Piero Antinori while an enology student in the 1970s and has faithfully served the company ever since, rising to his current position of CEO, head of enology, and de facto son to Piero. Even without including Antinori's Brunello di Montalcino (Pian delle Vigne) or Chianti Classici (Pèppoli and Badia a Passignano), not to mention the wines from its properties in Piemonte and southern Italy, the tasting revealed the breadth and depth of its portfolio. One may consider these modern blends to be firmly rooted in Italian tradition or wholly invented, representative of their geographical areas or facelessly international. But it is difficult to argue that, taken as a group, they're anything but well made, stylistically singular, and usually quite enjoyable to drink. The wines below were sourced from Antinori and the library cellars of Washington State's Ste Michelle Wine Estates, which handles the US distribution, and were opened and poured shortly before the event. All appeared to be in perfect condition. The event was attended by about 100 sommeliers and many other miscellaneous wine professionals. Cervaro della Sala is a blend of Chardonnay and indigenous Grechetto grapes grown near a medieval castle north of Orvieto. The first vintage of the wine was the 1985, and Cotarella has managed the property from the start. The Grechetto is fermented in stainless steel, so it adds not merely a different flavor profile but also a textural counterpoint to the Chardonnay, which is fermented in barrel. Together, they produce a white wine of uncommon complexity. "The idea is not just to make a Chardonnay," Cotarella says. "We want to make Cervaro, which is why we add the Grechetto." In its best vintages, Cervaro della Sala has the zing of a northern Italian white and the richness and elegance of a Burgundy. This is Antinori's Maremma wine, first produced in 1990. The grapes are grown on a 2,500-acre (1,000ha) estate that stretches from the Tuscan coast to the Bolgheri hills. A blend of Cabernet Sauvignon, Merlot, and Syrah for its first 17 years, it changed course with the 2007 vintage, when Cabernet Franc and a lower portion of Petit Verdot replaced the Syrah-a successful transition that has made for better wine. "Syrah sometimes can be a bit vulgar," Cotarella explains. "A little bit aggressive, a little bit simple. Cabernet Franc is more refined, and that's the kind of wine we want to make." Tenuta San Guido's Sassicaia started production several years earlier, but Tignanello-which debuted in 1971 from grapes grown inside the boundaries of Chianti Classico-can be considered the first true Super-Tuscan, a wine purposefully declassified into basic vino da tavola by the inclusion of grape varieties disallowed by its DOC. In this case, the grapes were Cabernet Sauvignon and Cabernet Franc. Added to the predominant Sangiovese, they produced a wine unlike Chianti or Brunello yet tasting unmistakably of the Tuscan hills. Tignanello was the first Sangiovese to be aged in small barriques, like Bordeaux, and despite its proportion of 80-85% Sangiovese, it can sometimes be mistaken for a wine from the Médoc-more often, in my experience, than Solaia, which is predominantly Cabernet Sauvignon. Other Super-Tuscans such as Masseto and Redigaffi may typically score higher in blind tastings or be considered more unctuously delicious, but in its finest vintages Tignanello competes against Sassicaia and Ornellaia as the most intellectually engaging wine from this part of the world. Solaia is Tignanello's inverse: a wine made mostly from Cabernet Sauvignon, augmented by 20% Sangiovese and a bit of Cabernet Franc. The grapes are grown in their own 25-acre (10ha) vineyard in the vicinity of Tignanello. Solaia was first produced from the 1978 vintage and since then only in what are deemed by Cotarella and the Antinoris to be exceptional years, though in reality it has been made in every vintage since 1992. The grape proportions haven't changed, but the wine remains something of a work in progress; by experimenting in the vineyard and the winery, Cotarella and his team continue to search for what he describes as a "perfection of personality." Recent vintages suggest they may have found it.